On Arrival visa in Dubai, UAE has been stopped since October 2015 for GCC Expatriates, However now you can apply online dubai visa. 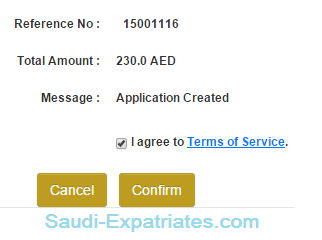 Please follow the below procedure to apply e-Visa for Dubai. 2. Valid original Iqama or Resident Identity Card with a minimum validity of 3 months from arrival date. 3. Valid original Passport with a minimum validity of 6 months from arrival date. 4. Credit card for online payment of Visa application. Validity of Visa : 30 days from the date of Issuance. Stay Period : 30 days from entry date. 1. Visit Ministry Of Interior UAE official website "www.ednrd.ae/"
2. A notification of instructions will appear on the screen, Read it carefully, Once you read click on "Accept". Click on "GCC Residents" topside of the left menu. 3. Once you clicked on "GCC Residents", You can see an application form which you need to fill online. Select the Emirate city from where you are entering into UAE from the available Emirate cities Abu Dhabi, Dubai, Al Sharjah, Ras Al Khaimah, Al fujeirah. If you are entering in Dubai, You can select the city "Dubai". Select the appropriate port based on the selected Emirate city from the available options of Port Of Arrival, If you are entering into Dubai Airpot you can select "Dubai Airport". - Enter your Full Name in English as mentioned in passport, Then enter your Full Name in Arabic, After that enter your First Name, Middle Name and Last Name in English and then in Arabic. - Enter Date of Birth, Birth Country, Present Nationality, Previous Nationality (If available). - Select your profession by entering few letters of your profession, If your profession is Programmer, just write on it and select from the displayed list. For your wife you can select "Housewives/Students/Retired" profession. - Enter your Passport Details, Passport Number, Passport Type, Date of Issue, Date of Expiry, Place of Issue, Country of Issue, As mentioned in your passport. - Enter your GCC details, Residence Number, Date of Arrival, Country of Issue, Arriving From, Residence Issue Date, Residence Expiry Date, Sponsor Name, Sponsor Address. 4. Click on "NEXT", Once you filled all the above information. - If you know the address where you are going to stay, you can enter the details, otherwise just select Emirate, City and enter Email ID. - If you are traveling with your dependents or family members you need to add them in Accompanied Information. Click on "NEXT". - In this step you can see the fee of online E visa including Service Fee, Application Fee and Issuance Fee. - Upload your Picture, Resident Identity or Iqama and Passport Copy, Click on "Review", once you upload. - Once you review all the detail, "Post" the data and confirm the payment by paying it through credit card. how many days it takes for the tourist visa to be approved and for the office to email the said visa back? In how many days i can get visa, after filling the form and payment?